Podcast: Listen to Lindsay Powell chatting with Dan Snow about Augustus for the History Hit podcast. Download the podcast here. – Tom Holland, presenter of BBC Radio 4 Making History. Author of Dynasty: The Rise and Fall of the House of Caesar. – Karl Galinsky, Floyd A. Cailloux Centennial Professor of Classics, University of Texas at Austin. Author of Augustus: Introduction to the Life of an Emperor. – Philip Matyszak Author of The Sons of Caesar: Imperial Rome's First Dynasty. - Ben Kane Author of Eagles in the Storm (Eagles of Rome series). You'll be £30.00 closer to your next £10.00 credit when you purchase Augustus at War. What's this? This is an different approach to the period, mixing a good political history of Augustus’s reign with a year-by-year account of the almost constant wars of his reign. The result is a book that clearly establishes just how important the Army was to Augustus’s success throughout his reign. Lindsay Powell is particularly careful in giving orders of the most precise battles possible as well as regular information on the geographical deployment of the legions. For any students of the period it's a valuable resource. Concise yet insightful, well-written and page-turning, this is a 'must buy' for every fan of ancient history. Powell is rapidly establishing himself as one of the leading authors of Roman non-fiction. 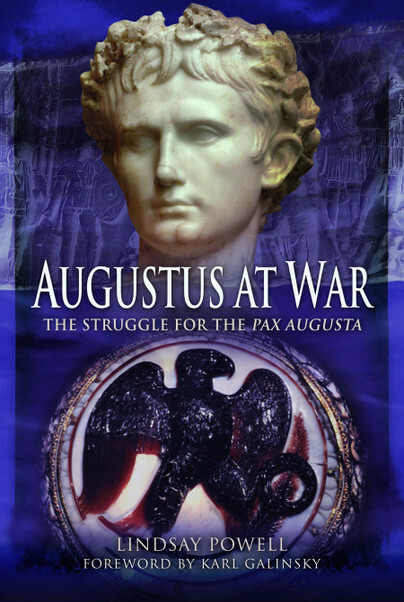 Lindsay Powell provides us with valuable insights into an under-appreciated aspect of Augustus' reign, and does so in his usual highly competent and readable style. In this book, Powell meticulously details and analyzes the composition, deployment, and actions of this army and provides a much needed resource of information that has no parallel in astute comprehensiveness. His superb treatment shows Imperator Caesar Augustus in action and helps us understand the military Augustus and his times more clearly. A superb analysis of the military power that underpinned Augustus’ rise to power, his conquests, and his ability to sustain his rule. Powell’s achievement is to demonstrate just how much Augustus deserved his name of ‘Imperator’. Listen to the new podcast, Army for an Empire: Augustus’ new Roman army, online here! LINDSAY POWELL is a historian and writer. He is author of several highly acclaimed books published by Pen and Sword: 'Augustus at War: The Struggle for the Pax Augusta'; 'Marcus Agrippa: Right-Hand Man of Caesar Augustus'; 'Germanicus: The Magnificent Life and Mysterious Death of Rome's Most Popular General'; and 'Eager for Glory: The Untold Story of Drusus the Elder, Conqueror of Germania'. He contributes to Ancient Warfare and Ancient History magazines and his articles have also appeared in Military Heritage and Strategy and Tactics. His appearances include BBC Radio, British Forces Broadcasting Service and History Channel.